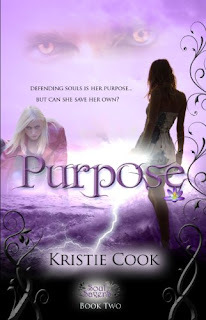 The wonderful Kristie Cook has done it again! Just like with her first novel, Promise, I fell in love immediately! I cannot wait until I can get the next one! This book takes place seven years after Promise ended. In that time poor Alexis has been in a horrible state of depression and many other mental problems. Her mother is still with her to help her care for her son. In this novel Alexis goes through many moods that she would classify as Foggy Alexis, Evil Alexis, Angry Alexis, Almost Normal Alexis, and etc…. But it does get better because guess what….yup I am so not telling you and you are going to have to read it to find out, but awesome! I can’t believe that everything turned out okay and that promises were able to be kept. Although a lot of obstacles stood in the past of happiness, Lexi overcame them and became the strong powerful woman that she is now. God I hate trying to explain this without spoilers and I don’t want to ruin it for everyone but things are crazy hard to explain anything! All I have to say is that if you have not picked this book up or the first in the series Promise….you really need to. You will not be disappointed! Autum has read 11 books toward her goal of 200 books.